Oracle BI is a business suite that is composed of leading technologies and applications designed to provide users with a comprehensive and fully functional enterprise performance management platform. This integrated system of business applications comes with powerful features that tackle reporting, mobile analytics, data integration and management, and desktop integration. Users also get superior applications for operational BI, data warehousing, and financial performance management. With Oracle BI, you can create a data-driven culture by utilizing robust visual analytics. The actionable insights you get can empower you to make smarter business decisions. You need extreme performance to analyze large data volumes. Oracle BI’s latest version (12c) includes new sophisticated features for in-memory processing to provide quicker analysis response times. Oracle BI Server speeds up performance with in-memory optimizations that deliver advanced-level memory usage for data of variable lengths, greater compression, and faster sorting and rollups. Oracle BI 12c is a simple yet robust upgrade from the previous 11g version. You can save effort and time while upgrading. Use a single file, the BI Application Archive (BAR), which offers everything needed to upgrade, move, clone, test, backup, and restore an application. BI 12c reduces IT investment and total cost of ownership (TCO), and streamlines performance management as it boasts lifecycle management and architecture improvements such as self-service tools, simpler and stronger security, and modular metadata management. Oracle BI provides businesses with timely and accurate information presented in detailed and clever ways to allow users to run their operations smoothly and easily. Highly valuable data derived from meaningful analytics and delivered quickly allows companies to create and deploy effective strategies to accomplish their business goals. With Oracle BI, users can: Consolidate transactional data into meaningful analytics and offer feasibility of exceptions and trends. Present this data to users in a user-friendly manner. Collect insightful details even from non-Oracle sources such as CSV applications and Excel spreadsheets. And, combine operational data and back office, and provide comparison with external benchmarks. Simplify your analytics plans by standardizing on a single integrated platform. Centralize your data metrics and model to get a thorough representation of your business. Enable users to securely access and analyze data from anywhere using the cloud and mobile devices. Make analysis richer and broader by connecting directly to Big Data and more Oracle sources. Your company’s important decision-makers can quickly find answers to statistical and predictive queries. Business analysts can run R scripts in batch mode to create mash-up data sets. Improve analytics with R scripts and speed up analysis by selecting from loads of pre-built functions. Use visually attractive analytics to create a tale around your business data. Uncover hidden data patterns by selecting from a vast library of visual components. Utilize intuitive, visual workflows to enhance productivity. Create rich data mash-ups to get unique and new insights. Analytics is optimized for voice – simply ask questions and you will get visualizations in response. View and analyze data on-premises or in the cloud. You don’t need coding skills to create mobile analytical apps that have interactive visualizations. Finally, you can create apps once and distribute them anywhere – the apps are compatible with any device and screen size. If you are interested in Oracle BI it might also be sensible to investigate other subcategories of Best Business Intelligence Software gathered in our database of SaaS software reviews. It's important to note that virtually no software in the Business Intelligence Software category is a perfect solution that can match all the goals of different business types, sizes and industries. It may be a good idea to read a few Oracle BI reviews first as certain solutions may excel just in a very narrow set of applications or be prepared with a very specific industry in mind. Others can function with an idea of being simple and intuitive and therefore lack complicated functions needed by more experienced users. You can also find software that cater to a broad group of customers and offer a complex feature set, but that in most cases comes at a higher price of such a solution. Make sure you're aware of your requirements so that you get a solution that has specifically the functionalities you look for. How Much Does Oracle BI Cost? View the Database Cloud Pricing page for pricing and service options. Buy Oracle Database Cloud Service to use with BI Cloud Service for advanced features, added storage, and seamless integration with your existing analytics. We realize that when you make a decision to buy Business Intelligence Software it’s important not only to see how experts evaluate it in their reviews, but also to find out if the real people and companies that buy it are actually satisfied with the product. That’s why we’ve created our behavior-based Customer Satisfaction Algorithm™ that gathers customer reviews, comments and Oracle BI reviews across a wide range of social media sites. The data is then presented in an easy to digest form showing how many people had positive and negative experience with Oracle BI. With that information at hand you should be equipped to make an informed buying decision that you won’t regret. What are Oracle BI pricing details? 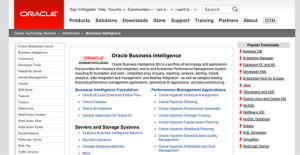 What integrations are available for Oracle BI? Pros: I'm not recommending a product, I am introducing a friend and an assistant! Oracle BI has been my right hand for few years so far, and I'm fascinated by its structured approach higher management and financial data. I believe this is the most powerful tool the school has used so far, since it deals also with student enrollment, and load and revenue analytics. I've seen it analyze fast and smooth, in a transparent process that displayes results on your very own dashboard. A diamond to have, indeed! Cons: My overall opinion is that this is an amazing product, but knowing how picky some of us can get, I feel the obligation to share that ad hoc reporting is not the best one ever. There are also some other small disadvantages, as for instance the lack of a customized SQL creativity which forces our developers to work with the RPD and SQL reports that have been given to them. It may not be an issue for smaller organizations, but ours often requires writing our oen SQLs and generating our own functionalities. As I said, I think this is nothing compared to the good features of the product, and I am standing behind my words. Pros: I wouldn't believe it if I hadn't seen it! In fact, I can associate every BI expereince I've had with Oracle BI, it does everything for me! I've used other reporting systems, but nothing compares to the easiness, simplicity, and versatility of OBI. That's what makes the system suitable for the needs of all business sizes and types. Cons: One doesn't really have an insight on bug fixes and common patches, as they are automatically produced. This is somehow understandable from a security perspective, but it is not helpful for managing multiple environments and gainiling ultimate benefits from your business. If you need more information about Oracle BI or you simply have a question let us know what you need and we’ll forward your request directly to the vendor.